Next on The Scoop: Call out “Bitey, Stroller!” and He’s There! Because pet strollers are a fairly new product, few people know what features to look for when shopping for one, although if you’ve shopped for baby strollers, you’ve got a headstart. Today we’ll arm you with all the info you need to make an informed pet stroller purchase. If you decide to buy, we can save you some bucks! 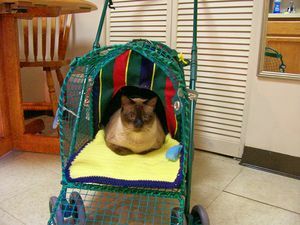 As an exclusive offer for readers of The Cat’s Meow, you can take 10% off any stroller purchase at JustPetStrollers.com. Now through 6/12, enter the coupon code “catsmeow” when you check out to save 10% on any stroller purchase. I know several cats who’ve gotten their strollers through JustPetStrollers.com, and they have raved about the personalized customer service, low prices and fast delivery, so I’m happy to recommend them. If you have any questions at all while you’re shopping for a stroller, just shoot them an email, and they’ll reply pronto. They’ll match any low price (with a few restrictions) and shipping is free. In addition to JustPetStrollers.com, Strollers.com is a good online source for strollers, and they also offer free shipping. If you want to burn some cash, they carry some sleek and very expensive Italian strollers — feline Furraris, if you will. Petsmart and Petco carry strollers, though not always in their bricks-and-mortar stores. I’ve seen them in some of the bigger stores, but only one or two models are usually kept in stock. Overstock.com and eBay are good sources for the bargain hunter. If you’re unsure whether your cat will enjoy strolling, buy a dirt cheap stroller on eBay, try it out, and then auction it back or donate it and upgrade to a model that will serve you better. What kind of terrain will you be strolling on? Sidewalks? Gravel or dirt trails? Uneven walkways? Small wheels are fine if you’ll be strolling on a smooth even sidewalk surface; otherwise consider the models with large (11- or 12-inch) wheels. How far will you stroll? If you plan on taking long strolls, invest in large wheels and padded handles. How often will you stroll? Low-end models will probably be sufficient if you don’t stroll very often. Do you saunter, power walk, or jog with the stroller? The faster you motor along, the better the wheels and the more stability you need. Joggers should consider the Jeep Rubicon. It’s inflatable rubber tires provide a smooth ride at high speeds, and the 3-wheel configuration and the fixed front wheel provide stability. The PetGear AT3 is a great choice for power walkers. Where will you store the stroller? If space is tight, consider a collapsible stroller. Will you travel with the stroller? If you’ll be packing it in the car (or dragging it up stairs), a lightweight collapsible model is your best choice. Will your cat be strolling solo, or will you double up? Strollers are weight-rated per what the frame can support, but you also need to consider your cat’s size relative to the stroller cabin’s size. They’ll need room to maneuver, especially when riding two at a time. Will your stroller need wind/rain protection? Many are made of rain-resistant fabric, and some come with rain and wind guards. Does your cat need a hidey place? 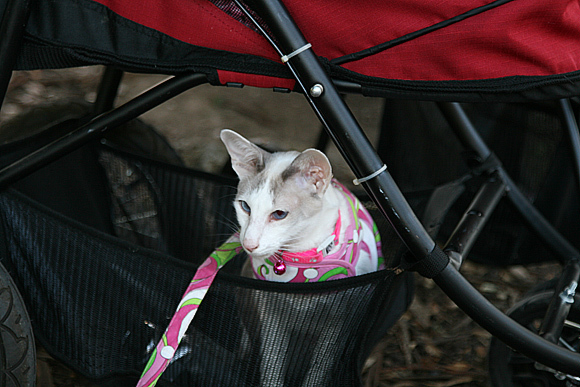 Some strollers (like those made by Kittywalk) offer a privacy area for your cat. Karen: What’s your best-selling stroller, Augie? Augie: Our best selling stroller of the past year is the one that several cats you interviewed own: the Pet Gear AT3 It’s roomy, rugged, and convenient. We’ve sold 50% more of them than our next most popular pet stroller. The ratings we get from customers are absolutely terrific. Karen: What’s the best value stroller you have for under $100? Augie: The one that probablysuits all cats and many dogs and is also the best overall valueis the Pet Gear Happy Trails. We have it at $84.99 including shipping to the continental US, and at that price it’sa very nice, reliable, sturdy, functional pet stroller. It has many of the features of more expensive pet strollers, such as a parent tray, a large basket for toys and water, and it folds for easy storage. The Happy Trails is priced just $5 more than the least expensive pet strollers we offer, and it is definitely a better, roomier stroller for the money. 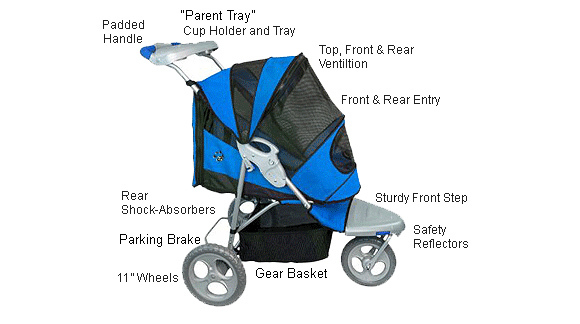 The diagram below shows a Pet Gear AT3 stroller. It’s one of the higher end strollers, and a very popular model. It features a padded handle (more important if you take long strolls); a cup holder and “parent” tray (I’ve never used mine); full ventilation top, front and rear (more important for good visibility than ventilation); safety reflectors; storage basket (this really comes in handy); 11″ wheels; parking brake; shock absorbers. Many models also feature interior leashes and cabin liners that remove for cleaning. 6 or 8-wheeler: Four wheel design (see right) utilizing small wheels, with double wheels on the front like the classic baby stroller design (some also feature double wheels on the back). If you only stroll occasionally at a leisurely pace and only for short distances on even surfaces, this design will probably suit you just fine (or will serve you well as an introductory stroller while you determine whether your cat likes strolling or not). Some higher-end strollers also feature a sturdier “professional grade” version of this type of wheel. 3-wheeler (non-inflatable tires): This is a step up from the classic baby stroller design. The 3-wheel design is more stable, the larger wheels (usually 11″ or 12″) provide a smoother, quieter ride, and its perfect for jogging and power-walking. If you plan to stroll on hiking trails, gravel or uneven terrain, choose a big-wheel model. 3-wheeler (inflatable rubber tires): I really love the rubber tires because the ride is effortlessly smooth and quiet. This design is best is you jog or do a fast powerwalk as part of the stroll, since it provides the most stability at high speeds. Believe me, cats LOVE to look out the mesh “windows” of the stroller, and the amount of visibility varies from model to model. The mesh also serves as ventilation. The more visibility, the better. One feature of our stroller that I like is a top-window, so I can see the cats at all times. The cats also like looking out the back. In the specs for each stroller, you’ll find a weight capacity that will provide a guideline for how many cats you can stuff inside. Believe me, you want to limit the number of cats per ride to two (unless, perhaps, you have a group of kittens), because the cats will jockey for position and move from front to back during the ride, and will need space in which to maneuver. The weight capacity is only a guideline, though, and what’s more important are the dimensions of the stroller’s cabin. Your cat(s) will need to be able to sit up without crouching and turn around comfortably inside it. Strollers are available that do double and triple duty as stroller, carrier, carrier/backpack or car seat. For example, the PetGear system shown on the right converts to both a carrier and car seat. As is the case with many multipurpose designs, it usually means that some design elements are compromised to accommodate the other purposes. In the case of the stroller, it usually means that either the cabin is a lot smaller OR the carrier is so large that it’s cumbersome. If your main objective is to stroll, you might be better off with a stroller built for strolling. But if you travel a lot with your cat, the multipurpose stroller may be purrfect for your needs — just don’t expect it to be comfortable for long strolls. Most models have parking brakes, and some also have hand brakes. The parking brake is super handy, especially if you live in a hilly area. 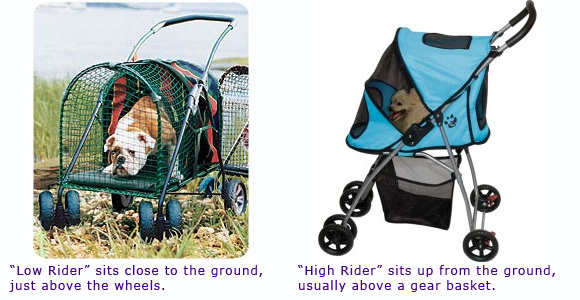 I’ve talked to a couple of cat owners who originally purchased low-rider strollers, but switched to high-riders. The primary reason to purchase a low-rider model is to allow easy access for animals who have a hard time jumping up into the stroller. This is rarely an issue for cat owners — if your cat isn’t ambulatory, you can easily pick her up and place her in the stroller. We store our stroller in the garage, so we always carry the cats to the stroller and place them in it. Easy access isn’t an issue for most cats, so I recommend a high-rider model. The cats will have a better view of the scenery, and if you encounter an overly-friendly dog, Fluffy won’t feel like the dog might be able to pounce on top of her — she’ll be above little yappy dogs, and eye-to-eye with larger dogs, which will make her feel more secure. Some strollers come with wind and rain covers. If you live in an area where the weather can change quickly or sudden showers are common, consider this option. Does it collapse for travel or storage? Many do. I have one of the larger models, and it folds up and fits nicely in the back seat of my small car. If you stroll a lot, you may want to vary your strolls to include parks and hiking trails, and it’s great to be able to pack up the stroller and go. Not all strollers are collapsible, so consider this before you make your purchase. JustPetStrollers.com has videos of some of the more popular strollers being folded — they can give you an idea of whether it’s something you can manage or not (video links are on the product pages). The specs for each model usually provide the folded dimensions so you can determine if, when collapsed, it will fit into its storage space or your car. The parent tray fits next to the handle and provides a cupholder in addition to a catch-all space for your cellphone, keys, etc. These are handier than you might think. We always bring along a harness and leash for each cat, a camera and sometimes a video cam, bottled water, a windbreaker, and before you know it the gear basket is full. When Skeezix and I go to Catster HQ, I drop a small cat litter bin into our gear rack. It’s a purrfect fit, and I don’t have to worry about him being stuck with nowhere to “go”. Toulouse, pictured at right, recently got the Kittywalk stroller as a birthday gift. Toulouse says, “I love the little parlor that is available for me in the back!” If your cats aren’t quite sure about the great outdoors, a stroller with an enclosed area can provide the privacy they need and make the stroll more enjoyable for them. If you purchase online (and often, even if you purchase in a bricks-and-mortar store), you’ll need to assemble the stroller before you can use it. Generally, it’s easier than assembling anything you might buy at IKEA, but if you’re not McGyver, you might want to set your sights on an easy-to-assemble stroller. JustPetStrollers.com provides you with an idea of how complex the assembly might be on each product page, and you can contact them before you buy with your questions. The stroller’s weight usually corresponds to how sturdy it is. But heavier is not always better. If you pack up your stroller a lot to travel to strolling spots, or if you travel with your stroller, you might want to consider a compact, lightweight model.